Chronic or recurring sinus conditions are among the most common of all medical problems. They are estimated to affect at least 40 million Americans annually, and nowhere more frequently than right here in our own backyard. Life in the Pacific Northwest provides year-round exposure to sources of sinus irritants. At NW Face Medical, Dr. Sunil Ummat, MD, an Ear, Nose, and Throat (ENT) specialist, sees patients with chronic sinusitis in Kirkland and from all over the Seattle area, including Bellevue and the Eastside. The sinuses are cavities surrounding the nose, cheeks, eyes, and forehead. They contain a thin layer of mucus, and when they are working properly, they drain efficiently and cause no problems. When infection sets in, however, the tissues in the sinuses become swollen and inflamed, often leading to a buildup of mucus. Sinus infections or allergies that cause inflammation in the sinuses can lead to a range of uncomfortable symptoms, including nasal congestion, sinus headaches, and trouble breathing. Normally, these symptoms are short-lived or “acute” and may be treated with home remedies or an antibiotic. Acute sinusitis typically resolves relatively quickly. 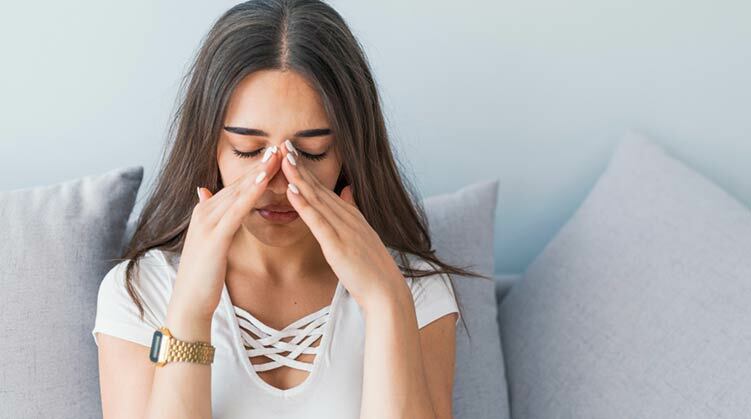 When sinusitis symptoms persist for more than 12 weeks, however, particularly when conservative treatments have failed to provide relief, the condition is known as chronic sinusitis. Some patients also experience sinus infections over and over again, even if symptoms do clear up between infections. Treatment of chronic sinusitis in Kirkland, WA varies depending on the cause of the sinusitis but may include allergy therapy or surgery if medications have failed to improve or control symptoms. Infection and inflammation in the sinuses can stem from a number of different causes. Acute sinusitis can occur due to simple bacterial infections, such as the common cold. Chronic sinus infections, however, tend to be related to structural issues in the ENT system, medical conditions, or allergies. Patients with asthma, allergies, structural problems in the nose, and other risk factors are more likely to develop recurrent sinusitis or sinus infections. Many of the patients we see from Kirkland, Bellevue, and Seattle with chronic sinus infections suffer from allergies to the vibrant plant life in the Pacific Northwest. It’s often fairly easy to tell when a patient has a chronic sinus infection. If they’ve been experiencing symptoms of a sinus infection for months without improvement (especially when medications have been used), then they likely have chronic sinusitis and inflammation. Many people find that their pattern of sinus difficulties increases as they age. Diagnosing the cause of chronic sinusitis is often much more challenging than identifying the issue itself. While most cases of chronic sinus infections are related to obstruction or allergies, tests may be needed to identify the specific cause. If you are experiencing ongoing symptoms that are consistent with sinus infections, then it may be time to schedule a meeting at our office. During your initial consultation at NW Face Medical, you will meet with our ENT specialists in Kirkland to discuss your symptoms and any treatments you may have tried before coming to our office. Dr. Ummat will ask you questions about your history of sinus problems and perform an initial exam of the area. Dr. Ummat or one of his associates will perform any necessary testing in order to give you an accurate and in-depth diagnosis. We can then recommend specific therapeutic modalities to effectively treat your sinus problems. This is an excellent opportunity to ask questions and discuss any therapies you may have tried in the past. When patients are experiencing acute sinusitis, our ENT specialists like to start with conservative therapies. These may include medications such as nasal sprays and antibiotics or over-the-counter and home remedies. Some patients find that breathing moist air with the help of a humidifier helps, while others find relief after a few days with rest and plenty of fluids. Chronic sinusitis typically does not respond to these treatment options. If patients have already tried these conservative approaches and have gained little or no benefit, our ENTs may recommend a more invasive and long-lasting treatment plan. The goal of sinus therapy, whether through medication or surgical intervention, is to restore normal and effective ventilation and drainage of the sinuses. Once adequate ventilation has been re-established, problems related to the sinuses generally disappear on a permanent basis. The treatment approach is customized to each patient’s needs and may combine a few different techniques. In many cases, chronic sinusitis is best treated with surgical or manual intervention, typically endoscopic sinus surgery or balloon sinuplasty. These are less invasive approaches that help to minimize trauma while encouraging proper drainage of the sinuses. They can be used to help correct structural issues or growths like nasal polyps that may be obstructing normal sinus function. For other patients, long-term immunotherapy, such as allergy shots, may be the most effective method for addressing chronic sinusitis symptoms. Patients who are found to have a chronic sinus issue may or may not be advised to try a surgical treatment soon after their consultation. Two of the most common sinus procedures that we offer for chronic sinusitis at our Seattle area practice are balloon sinuplasty and endoscopic sinus surgery. A balloon sinuplasty may be the first intervention our ear, nose and throat doctors suggest since it does not involve any incisions or cutting of the nasal bones. During a balloon sinuplasty, Dr. Ummat uses a flexible balloon catheter to open up the nasal passages and sinuses in order to relieve the symptoms of chronic sinusitis. The balloon is inserted into the nasal passages while deflated and is then slowly inflated to allow mucus buildup to drain out of the sinuses. The system is flushed with saline to remove buildup and provide relief. While the results of this procedure may not be permanent, many patients experience long-term relief with little to no downtime. Other patients may need surgery to address nasal polyps or a deviated septum. During this procedure, the patient is given anesthesia and an endoscope (a flexible tube with a light and small camera attached) is used to provide visibility while limiting trauma to the nasal tissues. Once the endoscope has been inserted, any obstructions can be removed and tissues rearranged to promote normal drainage of the sinuses. At NW Face Medical, the goal of endoscopic sinus surgery is to completely and permanently resolve symptoms by surgically reversing the obstruction. The endoscopic process allows us to accomplish this with minimal discomfort and downtime. After sinus surgery, patients experience a significant decrease or elimination of the need for medication. Since each sinus procedure may be somewhat different, patients will need to follow Dr. Ummat’s specific instructions for the recovery period. Some patients may be able to return to normal activities almost immediately, while others may need a week or two to heal. Strenuous exercise, in particular, may need to be postponed until the sinuses have healed. I keep getting sinus infections. Does this count as chronic sinusitis? If you have frequent acute sinusitis, you may need more treatment than someone who has sinus issues only once in a while. It is a good idea to consult with our ear, nose, and throat doctors to get an expert diagnosis. Do I have to try medication before surgery? Before resorting to surgery, our ear, nose, and throat specialists almost always try non-invasive solutions first. If these do not work, they may suggest surgery. However, patients who have tried these methods unsuccessfully before coming to our office may be eligible for more in-depth treatments right away. Are treatments for chronic sinusitis permanent? Some therapies focus on management, such as in patients with allergies. These may require ongoing medication and appointments. Other patients may gain long-lasting or permanent improvement from surgery or balloon sinuplasty. Each patient’s situation is different and there is no one-size-fits-all treatment or guarantees about how long treatment will last. Our skilled ENTs work with each patient to find the best option for their individual needs. In the past, sinus surgery was very invasive and involved a long recovery period. Today’s surgical approaches use advanced tools like an endoscope to provide permanent relief with less trauma. Patients may still experience some discomfort, but it is kept to a minimum whenever possible. Most patients find that short-lived discomfort after surgery is far preferable to living with chronic sinusitis. If my sinusitis is caused by allergies, what can I do? Patients with allergies may need immunotherapy, medications, and/or surgery to find relief. When you come to Northwest Face, you will work with our ENT in Kirkland to find a solution that helps you find the relief you’re looking for, based on the root cause of your problem. If you’re one of the many individuals suffering from chronic pain, infections, nasal congestion or drainage issues caused by a sinus disorder, it’s time to visit the Ear, Nose & Throat (ENT) team at NW Face Medical. Contact our team at 425-522-0555 to schedule your sinusitis consultation today with our respected ENT Dr. Sunil Ummat at our Kirkland office, WA office. We serve the entire greater Seattle area, including Bellevue and surrounding communities.